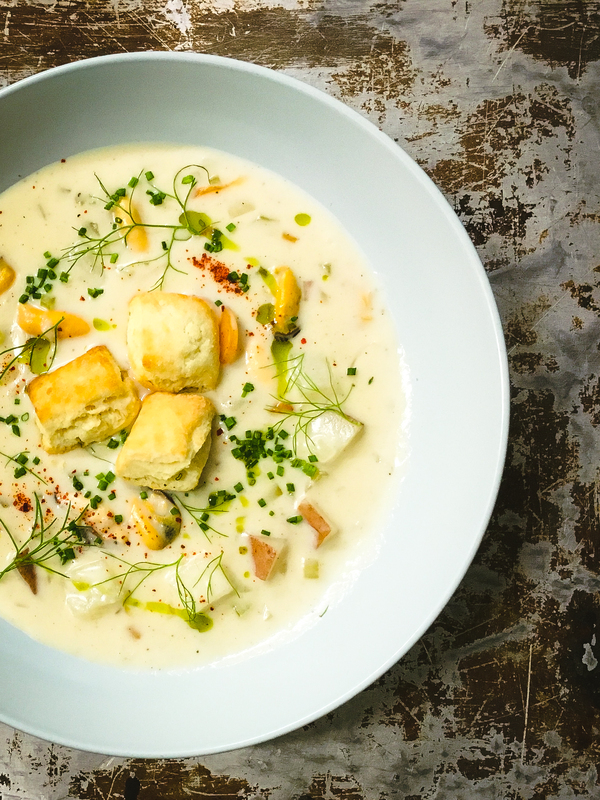 This potato mussel chowder recipe from Loka is so easy to make we may regret publishing it. Mussel chowder is synonymous with Prince Edward Island on the East Coast of Canada. Dave moved there for seven years to learn more about cooking seafood. He competed and won many cooking competitions so I laugh that they only earned a silver medal. While this is a silver award winning mussel chowder recipe I can’t imagine how it would be better. Many people think of the East coast as one homogenous region it couldn’t be more wrong. Yes it’s a tiny population. In fact Prince Edward Island and Nova Scotia share one area code. But they do not share the same chowder recipe. I still make my grandmother’s Nova Scotia chowder recipe but it doesn’t include mussels. 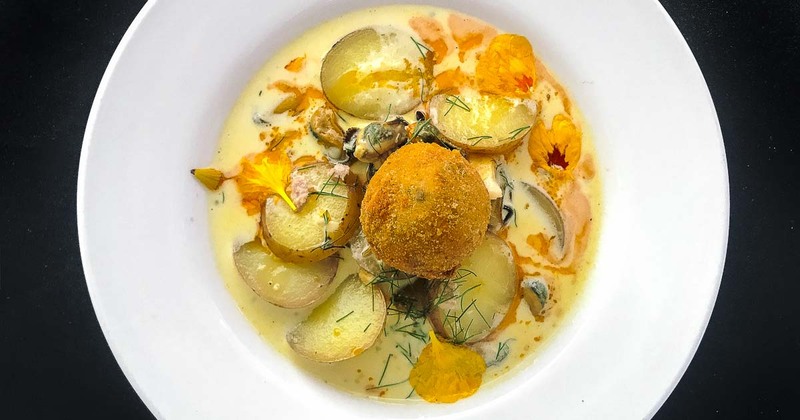 This mussel chowder recipe is unique to Prince Edward Island – a small island where there are a significant number of locals who have never left. But chowder is different. Chowders almost always use milk or cream. Although I have no idea why the Manhattan clam chowder or Bermuda fish chowder are labeled chowder. Without cream it’s really a clam soup. I guess every rule needs its exceptions. There are few dishes that I could call Canadian food but chowder is such a stamp in my childhood I would call it the dish of the Maritimes. Chowder is serious on the East Coast. A restaurant has a very difficult time answering to locals if it’s not on the menu. Most cafes serve it and and there’s almost always an option for a cup vs a bowl. If you’re like my mother you’ll always choose the cup of chowder and 1/2 sandwich combo. It is such a a staple growing up although I fear the tradition of making it at home is dying with our grandparents. It was one of the first things I learned to make in university, I simply needed to pick up “chowder mix” in the seafood section of our grocery store. Chowder mix is simply fish and seafood scraps but these scraps make it affordable. When I first moved to Toronto I searched far and wide for chowder mix but it does not exist here. No one seems to know where the term chowder came from. 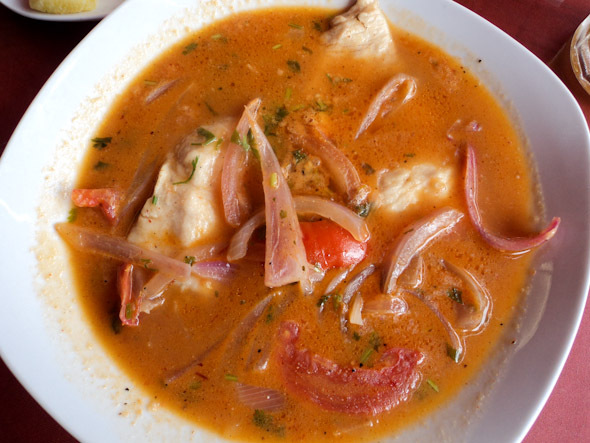 Wikipedia appears to have the most logical guess that evolved from the thick fish soup chaudrée (sometimes spelled chauderée), which is a type of thick fish soup from from the coast of France. This makes sense as the East coast was first settled by the French and many of our traditional dishes are French influenced. In the Maritimes chowder is fish, seafood or both with potatoes, celery, carrot and onions. It’s really quite simple. I have never seen clams or corn in a chowder seems to be more a New England style chowder. I’m a traditionalist but the idea of corn in my chowder makes me shudder. Although I grew up on chowder it was an everyday version, usually made with 2% milk. At Christmas my sister proclaimed at Christmas Dave ruined her forever. No chowder was as good as his. The secret is a lot of butter, cream and pancetta. 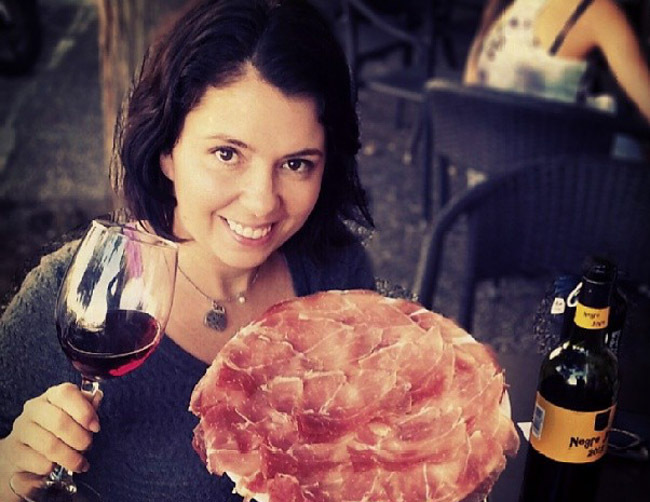 At Loka we modified the recipe and do not use pancetta so that our pescatarian guests can order it. It’s still great but really the pancetta takes it to the next level. Remember bacon is magic. This is such an easy dish for entertaining as you can make it in advance. Chef tip: if you’re going to reheat the chowder wait to add the cooked mussels. Otherwise they may overcook and lose firmness. Don’t forget chowder needs carbs. Serve buttermilk biscuits, great bread rolls or go retro diner style and give everyone a pack of saltine crackers. If you’re serving wine a traditional chardonnay pairs well with the creaminess of chowder or you could balance it with a sauvignon blanc that has a mineral, grassy finish. I love this mussel chowder recipe because it’s simple and inexpensive but so decadent and filling. You will not walk away from a bowl of mussel chowder wishing you had more. If anything you’ll wish you had more room in your stomach. Wash and scrub mussels free of beards and dirt. Add mussels to large pot with white wine, garlic and thyme. Steam for 5-7 minutes or until all mussels are open. Strain mussels from pot saving every drop of the mussel broth. Shuck mussels from shell and keep chilled, discard any mussels that don’t open. In a large heavy bottom pot, add pancetta and begin to cook over medium heat to release fat. 6. Add carrots, celery and onions to pot and sweat for 3-5 mins. Add potatoes and cook for additional 3 minutes. Add flour and mix to create a roux. Cook roux until it smells like toasted butter about 3-5 mins. Add the mussel broth and whisk to break up the roux. Add milk and cream and continue whisk over med heat to cook roux and remove any flour flavour. Reduce heat to low and cook for 30 mins to cook vegetables all the way through, stirring every few minutes to avoid scorching. Season to taste and finish with chopped chives and other greens. Enjoy! My grandmother passed a few years ago but stamped in my memory is Friday chowder in bowls with mug handles on them and brightly coloured balloons. But what makes me smile the most is that my grandmother didn’t like recipes to change so even though this mussel chowder is incredible, I know she’d turn her nose up at it. Looks soooo good! Definitely going to give this a try. Recipe saved for the next time we buy mussels! I agree that ‘bacon is magic!’ will be making it with the pancetta for sure. The first time I ever had chowder was in a little community hall in Peggy’s Cove. It was incredible, yet frustrating in hindsight. This homemade and local chowder kind of spoiled me for all of the cheaper (and more ubiquitous) versions out there. But I’ve gotta say, this makes me genuinely excited – it looks amazing, and it is wonderfully simple. I think it’s time I dive in and start making chowder like this myself so that I can truly experience that incredible flavour again. Plus pancetta. Because yes, bacon is magic. 😉 And maybe I’ll cook my way through a few variations too – as you point out, there are all kinds of interesting differences! That looks absolutely incredible. I must try this. Thanks. This sounds so good. Can’t wait to try it! What a stunning looking soup! I just took part in a soup exchange, so my freezer is full at the moment…but I would really love to give this soup a try. As with any kind of chowder, saltines are a must! Absolutely with full fat cream it freezes quite well. I would love to do a soup exchange, what an awesome idea. 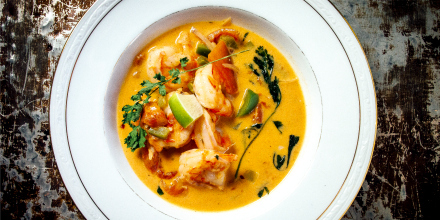 What a beautiful and delicious sounding dish, perfect for this time of year! And thanks for the lesson on Fish Soup vs Chowder — very interesting. I haven’t yet visited our Canadian east coast but it’s definitely on my bucket list. Have a great week! You will find lots of chowder on the East Coast but do yourself a favour and go in the summer or fall. Winters are brutal. I just came across your gorgeous chowder at Girl Heart Food. Love all the ingredients and luckily today’s high is only 59 degrees F (great respite from the 100 degree days we’ve been having). Looks like we’ll be able to have mussels chowder for dinner tonight (will need to replace the haddock with cod, but think it will be OK)! I love it when things line up perfectly:) Pinned! I’m so happy to hear that! And absolutely cod is a great choice. and “1 lb all-purpose flour”. Photo looks yummy though. Hi LJ, this is the correct amount of flour and butter. Is that what you were concerned about? 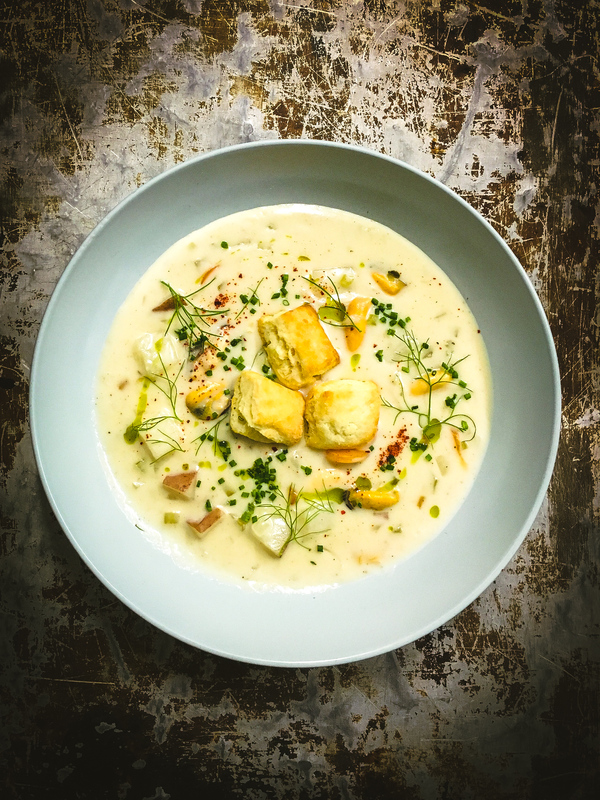 Yes you’ve read that right, this is a restaurant recipe and mussel chowder is very rich – definitely not something you’d want to eat daily but it’s meant to be decadent.